110 tickets left! Available For 10 More Days! Sit down luncheon and gift of autographed book from our Celebrity Author, Jill Teitjen. After you purchase ticket, open email confirmation to order lunch. 8' table- includes one-luncheon ticket, all additional table help must purchase luncheon ticket, 9AM setup. You are invited to join us at our annual 'Meet the Author' fundraiser held SAT, May, 4, 2019 at the Fort Collins Country Club. We highlight women authors each year hosting this event the weekend before Mother's Day weekend. Celebrate women in your life with an invitation to join you. This year you will not want to miss our author Jill Tetijen. Tickets go on sale FEB 23, 2019. Buy your ticket today. Tickets: $50 includes sit down luncheon and autographed book from our Celebrity Author, Jill Teitjen, Author of Her Story: Women Who Changed the World. Tietjen is a frequent keynote speaker at engineering, science, and women's conferences and is often profiled in the media. 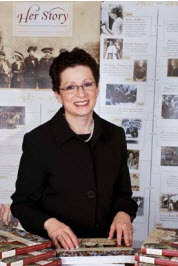 The culmination of Tietjen's diverse background is thebestselling and award-winning book Her Story: A Timeline of the Women Who ChangedAmerica (Collins), co-authored with Charlotte S. Waisman, for which they received the 2012 Daughters of the American Revolution History Award Medal. The proceeds from this fundraising event support our scholarships for single Mom's, young women in high school and in college. If you cannot attend we invite you to consider a donation in support of our scholarship fund. Thank you.